The ultimate directory of losers, nonentities and scum from all walks of life. First published in 1932, Who's Nobody is now considered the most authoritative source of biographical information about the lowest strata of society. 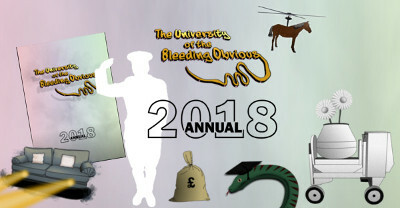 Layabouts, wasters, swindlers and other assorted chav scum are all celebrated in its august pages, giving a unique insight into the lives of the least influential members of society. 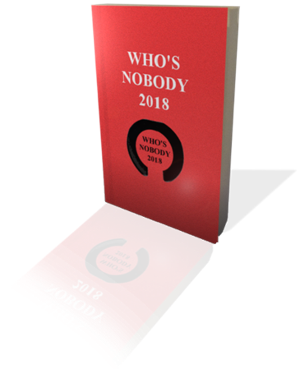 With over 90,000 entries, the 2018 edition is the most comprehensive directory of scroungers, malingerers, slackers, shirkers, racketeers, dross, fartabouts, pilferers, fraudsters, parasites, drifters, bottom-feeders, snivellers, snufflers, dribblers, ditherers, whingers and general filth who ever managed to drag themselves out of bed in a morning and slump in front of the TV. It is the ultimate incentive for anyone who needs motivation to get off their pimply backside and do something worthwhile with their lives.